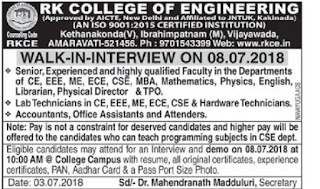 RK College of Engineering, Vijayawada has advertised in the Eenadu newspaper for recruitment of Teaching Faculty,Non Teaching Faculty jobs vacancies. 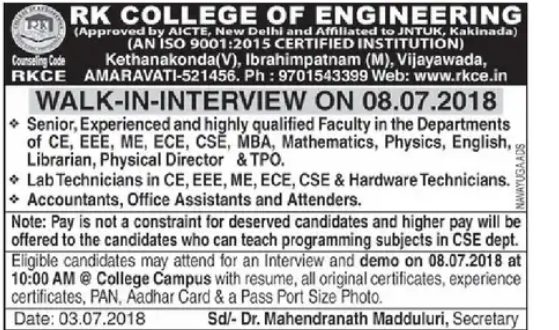 Interested and eligible job aspirants are requested to attend walk-in interview on 08-07-2018. Check out further more details below. Name of the College : RK College of Engineering, Vijayawada. About College: R K holds the promise of different life; the institute was founded with the noble vision to raise professionals and leaders of high academic calibre and unblemished character, nurtured with a strong motivation and commitment to serve humanity. Pay is not a constraints for deserving candidates and higher pay will be offered to the candidates who can teach programming subjects in CSE dept. How to Apply: Interested candidates may attend for an interview and demo on 08.07.2018 with your resume along with PP photograph, copies of educational qualification and experience certificates, Pan and Aadhar card. 08.07.2018 at 10a.m @College campus.